UPSC Civil Services syllabus is available here. Aspirants can download UPSC Civil Services Prelims Syllabus & UPSC Civil Services Mains Exam syllabus here. Also, get updated UPSC Civil Services Prelims Exam Pattern & UPSC Civils Mains Exam Pattern 2018. So, the candidates who applied for the UPSC Civil services IAS IPS Exams may download UPSC Civil Services Syllabus along with the UPSC Civil services Exam Pattern 2018 from the below links. Applicants who are searching for UPSC Civil Services Syllabus and UPSC Civils Exam Pattern are in the right place. In order to help all the UPSC aspirants here, we have updated the latest UPSC syllabus of Prelims Exam and UPSC Civil services Mains Exam 2018. To achieve success in the UPSC Civil Services Exam, the main thing that an individual aspirant should follow is a proper preparation strategy. The ideal exam plan can be prepared with the help of UPSC Civil services Syllabus 2018. By referring the Union Public Service Commission UPSC CSE Exam Pattern, the candidates can know the scheme and pattern of the UPSC IAS IPS Examination 2018. Hence, all the applicants should download the UPSC CSE Prelims Syllabus 2018 from the below sections and also, check latest UPSC CSE Prelims and Mains Exam Patterns of 2018. Check Syllabus for other Central Govt Jobs here. UPSC Board issued an employment notification for the recruitment of UPSC Civil Services Exam 2018. The UPSC Recruitment Notification is released to fill 110 vacancies in the Group A and Group B Cadre. So many UPSC aspirants have been applied for the UPSC Civil Services Exams. Hence to guide them, we provide the Syllabus of Civil Service Exam along with the UPSC Civils Exam Pattern. To achieve the UPSC Civil Service proper preparation plan is necessary. Therefore, by downloading the Indian Civil Service Syllabus and UPSC civils Exam Pattern 2018, the applicants must prepare a perfect plan and prepare well for the UPSC Civil Examinations. In IAS Prelims Exam, there will be two papers – Paper I & Paper II. UPSC Paper I consists questions on General Studies and total marks are 200. The Paper II is Civil Services Aptitude Test (CSAT) for 200 marks. Exam duration is 2 hours for each paper. The Civils Mains Exam is Descriptive type. The UPSC IAS IPS Exam consists of nine papers. Paper-I & Paper-II are only qualifying papers of 300 marks each i.e., the candidates must need to qualify these papers. Also, the marks obtained will not be counted for ranking. The evaluation of the remaining seven papers will be done, only if the individuals get 25% qualifying marks in Paper-I & Paper-II. Paper-I is for Indian Language. The people must select anyone Indian Language from the Languages included in the Eighth Schedule to the Indian Constitution. Paper-II is for English for 300 marks. Also, check latest Notifications for other State Government Jobs here. 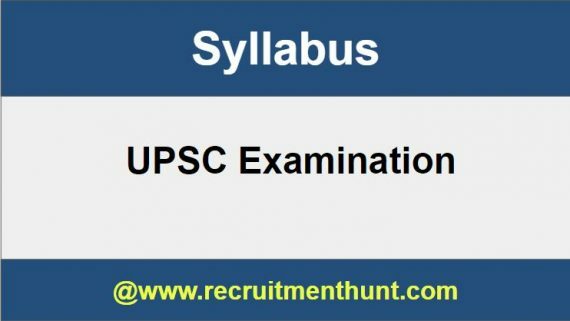 The detailed UPSC Syllabus Civil Services for both Preliminary and Main Examinations is as follows. General issues on Environmental Biodiversity, Ecology, and Climate Change. History of the World and Society. Geography of the World and Society. Aspirants may choose any ONE optional subject from the list of subjects given below. Therefore, the detailed information regarding the UPSC Civil Services Syllabus for Prelims & UPSC Civil services Mains Syllabus along with the Exam Patterns are available on our site. Finally, Recruitment Hunt wishes Good Luck to all the aspirants.